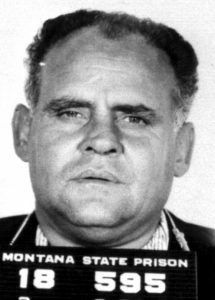 In the 30 years since his last days as warden, Ed “Bus” Ellsworth had never gone inside the old prison in Deer Lodge, Montana. I coaxed him back on a raw March afternoon, anxious to hear what he could remember about the 1959 riot and its aftermath. I was researching a book that I planned to write someday. I didn’t have a title for it because, like writers do, I was trying to find the central story. Newspaper reports of the day described the riot as “a failed escape attempt by a desperate madman.” That seemed much too predictable an explanation, and I thought Ellsworth could give me some perspective. I knew he played a prominent role in ending the riot. I wanted him to trace the steps he took that cold starlit night on April 18, 1959, when National Guard troops stormed the cell houses to rescue 23 hostages the ringleaders had vowed to shoot, hang or burn. 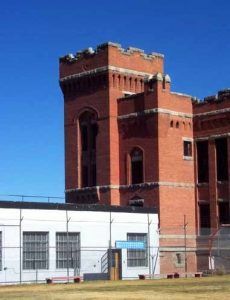 Old Montana Prison’s brick and stone facade loomed just blocks from Ellsworth’s living room window, yet in the sunset of his life, he thought of it as a distant place. At first he told me he didn’t want to go. He said he couldn’t remember much that would help me. When I was a boy I knew him as Warden Ellsworth, an iron-disciplined man with a military buzz-cut. Being my dad’s boss, he seemed all the more unapproachable. One summer he caught me sneaking into the drive-in theater south of town. All the kids did it, once or twice anyway. My friend and I, creeping through the river willows near the drive-in, attracted attention from passing motorists who had heard news reports of two inmates escaping from a prison ranch. I don’t know if I was more scared of the warden and the tall prison guard who stood beside him with a rifle, or of my dad if he found out. Ellsworth drove us home in the back of a prison cage car, gold with a green stripe across the hood. If he ever told my dad, I didn’t hear about it, but I regretted right away that I hadn’t paid the dollar or so to see the movie. Montana Prison Museum Cells, by Kathy Weiser. On the day that I drove Ellsworth to the prison in my blue pickup, he didn’t mention that incident. Maybe he forgot about it, but at my age, I didn’t feel inclined to remind him. He forgot his earlier hesitation when we started talking about the riot. An opportunity to set the facts straight can be powerful persuasion to an old man. I told him how I had collected hundreds of pages of documents that detailed the long federal prison career of Jerry Myles, the riot’s chief antagonist. Anyone familiar with the riot knew his name but not much else. Until I read those records, I didn’t realize that Myles was much more than an ordinary convict. His riot wasn’t an escape attempt, as Ellsworth’s predecessor, Floyd Powell, tried to convince everyone. Myles was a psychopath, trained in America’s worst prisons. The riot in Deer Lodge mimicked a bloody outbreak he had watched at Alcatraz Island during his incarceration there, and even earlier, a mutiny he led at a federal penitentiary in Atlanta. Myles was a student of prison riots. He didn’t want to escape from Montana State Prison. He wanted attention, even if that meant dying. When Ellsworth and I arrived at Old Montana Prison, now a museum, we met retired guard Bob McNally. 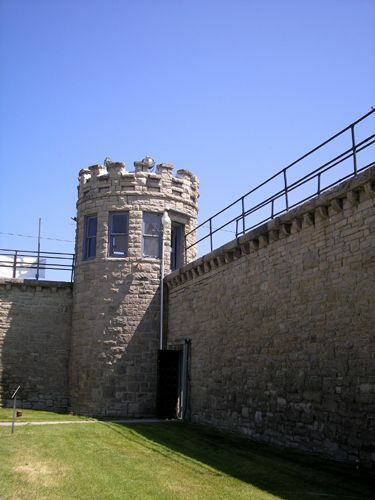 He brought the key to the outside door of the northwest cell house tower, where Ellsworth led three men up the stairs to flush out Myles and Lee Smart, his teenage boyfriend. Smart, convicted of murdering a traveling salesman in northern Montana, shot and killed Deputy Warden Ted Rothe when the riot began. More than 30 hours later, as the riot crumbled, Myles and Smart retreated to the tower of Cell House 1 with two rifles they seized from catwalk guards. McNally pried open the rusty lock. He waved his flashlight beam around the dark cavern. Plywood covered windows from the inside. Bars remained intact. Pigeon droppings matted the stairs and floors. We climbed the narrow concrete stairs to rooms that were dark and cold and felt, in the context of our visit, like death. We crossed the landing where Myles shot and wounded Captain Francis “Russ” Pulliam, a National Guardsman from Missoula. On the fourth floor, sunlight peeped through the broken brickwork along tall windows where two bazooka rounds hit before rifle teams charged into the prison yard. Then Ellsworth took us to the tomblike room at the top of the tower. In a measured voice, he described the murder-suicide that took place there. Before the National Guard could take them captive, Myles killed Smart and then himself. Ellsworth found the bodies. Like many other people I had interviewed, he described Myles as having no other apparent motive but to make a name for himself. “It was his riot,” Ellsworth told me. Suddenly the meaning of that riot jumped out at me from documents, interviews, and photographs. Yes, the story was about guards and prisoners caught in the violence. Yes, it was about the failed attempts of Powell, the new warden, to reform a terrible prison. And yes, the story was about a small town in western Montana that sent generations of men to work inside the walls. Without the tragic self-indulging Jerry Myles, however, the story didn’t exist at all. That’s why I chose “Jerry’s Riot” as the name of my book. As Ellsworth wandered around the old prison that day, encountering memories wherever he turned, he told me that the prison was a terrible place to work. Many guards never wanted to come back inside. Ellsworth, a World War II veteran, former Powell County sheriff and a longtime National Guard colonel, died in 2001. Many others I interviewed are gone too: Everett Felix, the guard captain was taken hostage; Victor Baldwin, another guard hostage who died recently in Deer Lodge; Elmer Erickson, the prison’s business manager at the time of the riot, and Carl Parish, a prison employee nearly captured during the takeover. To them and many others, I interviewed for Jerry’s Riot, what happened over three days in 1959 stuck to their minds like glue, but they didn’t care much for reliving their prison days. Only Jerry Myles, it seems, wanted to stay. About the Author: Kevin S. Giles, a native Montanan, is the author of Jerry’s Riot: The True Story of Montana’s 1959 Prison Disturbance. 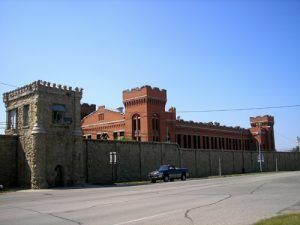 Like many sons and daughters of prison guards, he finds some of his past at the Old Montana Prison in Deer Lodge, his hometown. He is a journalism graduate of the University of Montana and has worked as a reporter and editor for several newspapers. 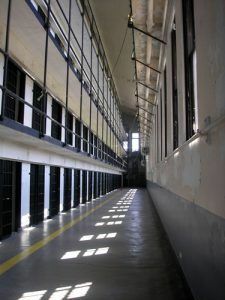 Gile’s nonfiction book, Jerry’s Riot, tells a dramatic story about one of Montana’s most interesting historic designations — Old Montana Prison in Deer Lodge. Further details about the book are available at Sky Blue Waters Press.